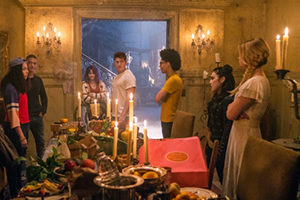 Runaways season 1 ended with the kids finally running away from the safety of their parents’ homes after discovering the part they played in the murder of 16 children, and a potential devastating earthquake right in the heart of Los Angeles. In a set visit this fall, we sat down with Rhenzy Feliz, who plays Alex Wilder, to talk about the de facto leader of the Runaways and his role in the group. Season 2 begins with the Runaways dealing with the reality of living homeless in Los Angeles (which has the largest unsheltered homeless population in the United States, according to a recent study… we’re #1! ), all while being hunted down by their parents, whom they now fear. And for Alex, the only apparently powerless Runaway, there’s the pressure of his friends who seem to expect him to sort out how they’re going to live now. So we asked Feliz, does he feel the others are putting him in this position because he is the only one of the group without powers? Alex and the team at their new base. Runaways season 2 drops in its entirety on Hulu on December 21, 2018.